Wheelchair Users More Likely To Be Killed in Collisions | Hupy and Abraham, S.C. According to new research published in the online journal BMJ Open, users of wheelchairs are three times more likely to be struck and killed by an automobile than any other pedestrian. While the Department of Transportation keeps track of the number of pedestrian injuries and deaths, they provide very little information regarding the specific details of these accidents, such as how often pedestrians who are mobility-impaired are killed. So, Georgetown's School of Nursing & Health Studies decided to analyze police reports of road traffic collisions and news stories about wheelchair and car crash fatalities. The greatest risk is to men in wheelchairs, aged 50 to 64. Nearly half of documented fatal collisions occurred at intersections. In about 4 in 10 of these incidents, traffic flow was not controlled. Police reports show drivers frequently failing to give the right-of-way to pedestrians in wheelchairs. In three-fourths of crashes, there was no evidence that the driver sought to avoid the crash. Pedestrians in wheelchairs were not sufficiently visible in 15 percent of occurrences. These findings point to a major lack of a safe, pedestrian infrastructure that is accessible for those with mobility impairments, and a serious failure of compliance with the Americans with Disabilities Act. 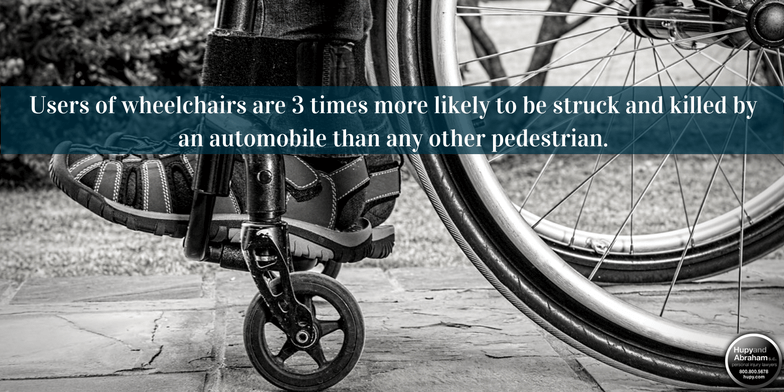 This lack of oversight leaves pedestrians in wheelchairs at greater risk of death due to pre-existing medical vulnerabilities, decreased visibility, and the severe nature of these accidents. This data should compel municipalities to invest in well-designed curb cuts, ramps and sidewalks to better protect and serve vulnerable pedestrians. At the same time, every motorist has a responsibility to act safely and to try to avoid all types of pedestrian accidents. But local governments and police departments must also help by enforcing pedestrian right-of-way laws. To educate the public on all types of driver and pedestrian safety, Hupy and Abraham’s “Save a Life. Yield to Pedestrians.” public service announcement (PSA) has aired about 1,000 times in Wisconsin, Illinois and Iowa. Attorney Michael Hupy has even appeared on live television and written letters to local police chiefs to raise awareness. Everyone needs to work together to save all pedestrians’ lives. You can help spread awareness with a FREE “Yield to Pedestrians” bumper sticker, available here.